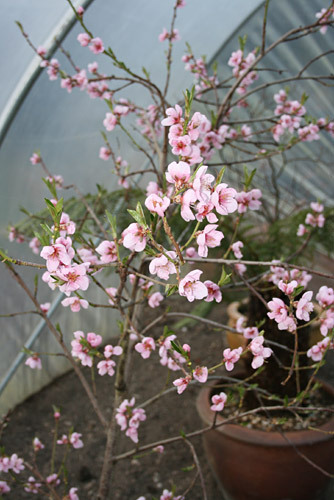 I spent a couple of hours in the polytunnel today and the Nectarine is in full blossom. It looks absolutely gorgeous … I thought I must share it with someone. It’s one of the many signs that Spring is well and truly on its way. At this time of the year there is a distinct lack of flying insects in the garden, and there is little to no wind in the polytunnel, so tomorrow I’ll get a soft haired paint brush and help them along with a little artificial pollination. As soon as any threat of frost has passed I’ll move it out into it’s summer position. Nature is a truly wonderful thing.